In Exodus 17:15, after the Israelites were victorious over the Amalekites at Rephidim, it says that Moses built an altar there and called it Adonai Nissi, or” the Lord is our banner”. I had heard this term before, when a pastor preached on the names of God, such as “Jireh” provider, “Rapha” our healer, and others. But, I never had a real clear picture of how the Lord could be a banner, until I went to Egypt. First of all, “Nissi” means banner, standard, ensign, or marker. The flagpole and banner were very meaningful, even back in ancient civilization. 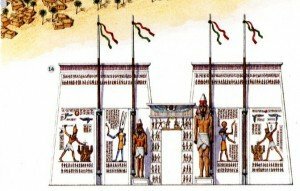 As we began to study the Pharaoh’s at their temples, we learned that they used the flagpole to display their banners in front of every structure. They built huge, elaborate entrances to their temples and used the flagpoles to decorate the entrances. They would build a series of pylons along the front with an indentation every so often. In these recesses would go huge flagpoles, up to 100 feet high, with the banners of the king. 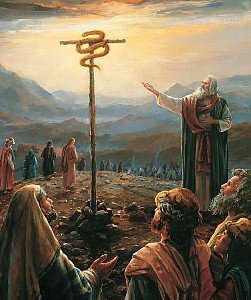 Later in the Exodus story, Numbers 21:8-9, Moses puts a snake on a pole, and it becomes like a banner. Also, in Isaiah 11:1-10, especially verse 10 – “In that day the Root of Jesse will stand as a banner for the peoples…”. 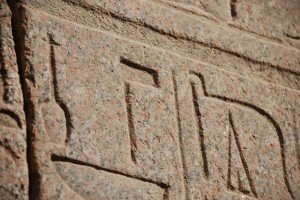 Then Jesus says in John 3:14-15 – “Just as Moses lifted up the snake in the desert, so the Son of Man must be lifted up, that everyone who believes in him may have eternal life.” As we have seen so often in studying the Exodus, it always ties back to Jesus. The banner that Moses lifts up becomes pictures of our Messiah 1500 years later. The Lord Almighty, and his son Jesus are our banners, our ensigns, our standard and, everything we do, we do for them. This was another great example to me that if you know the culture and history, the story was easier to understand. I now have a good mental picture of the Lord, being our banner. He is our king and we wave his banner high! A rabbi once said the resume of a follower of God should be very short. While we were in Egypt, we saw picture after picture that told the common people that Pharaoh was responsible for the good things that happened in life. He made the Nile flood, he provided the good crops, he handed out justice to Egypt’s enemies; he alone was in charge. When you go to the Promised Land do you still give God credit for what happens or is it by your strength and your power that good things happen. These are all typical statements we make without thinking of the source of all our blessings. It is easy to count on God when you’re in the desert and you can’t begin to do it yourself, but when things go smoothly it doesn’t take us long to try to handle it ourselves and take the credit. In the story of the Exodus, the Israelites are faced with three tests starting in Exodus 15:22-27. At Marah, after they had had no water for three days, God led them to water but it was bitter. In verse 25 it says there he tested them. Their third test was at Rephidim and the water from the rock incident. Again, they were without water, and they actually tested the Lord saying, is God really among us or not? Huge mistake. Moses called the place Massah (testing) and Meribah (rebellion). See Psalms 95:7-8 and Hebrews 3:7 to 19. Now, fast forward to Jesus. How many tests, did he incur and where did those tests occur? Three in the wilderness. The first similarity that you catch is that Moses in Deuteronomy 9:9 says. “When I went up on the mountain to receive the tablets of stone, the tablets of the covenant that the LORD had made with you, I stayed on the mountain forty days and forty nights; I ate no bread and drank no water.” Jesus follows Moses’ example by going up on the mountain and eating nothing for 40 days and nights. When the devil tries to test Jesus, when he knew he was hungry, by telling him to turn the stones into bread, Jesus quotes the Deuteronomy 8 passage where it says that God caused the Israelites to hunger and then fed them with manna, so that they would know that man does not live by bread alone. In the third test, the devil told Jesus, if you are the son of God, throw yourself down and God will save you. Jesus again quotes Deuteronomy 6:16, which says don’t put the Lord your God to the test. Don’t test God’s faithfulness like the Israelites did in their third test at Massah and Meribah. They were saying “God give us a miracle!” God gave us a miracle, his son died for us. 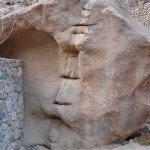 The similarities in the Exodus test, and Jesus’ tests are very evident. And you know a Jewish mind would immediately go back to Deuteronomy 8 when they heard what Jesus did. Matthew’s order of the three tests swaps numbers two and three and RVL suggests that Matthew changed the order to correspond to the Shema – love the Lord your God with all your heart (food, sustenance), all your soul (gave his son, gave all), all your might (could have had all power and might but rejected it). Jesus faced those three tests continually – all your heart, all your soul, all your might. “You are Israel’s teacher,” said Jesus, “and do you not understand these things? I tell you the truth, we speak of what we know, and we testify to what we have seen, but still you people do not accept our testimony. I have spoken to you of earthly things and you do not believe; how then will you believe if I speak of heavenly things? No one has ever gone into heaven except the one who came from heaven-the Son of Man. Just as Moses lifted up the snake in the desert, so the Son of Man must be lifted up, that everyone who believes in him may have eternal life. I’m having trouble getting my thoughts collected on this subject, but I wanted to write down some new thoughts I’m having on the idea being saved. Christians have always made the John 3 passages about how do you get to heaven when you die. As I am learning more about the Kingdom of Heaven, I am thinking that the John 3 discussion has more to do with the “right now” instead of the “later”. First of all, Nicodemus did not ask what he had to do to obtain eternal life like I had thought. He just starts a dialogue with Jesus by telling Jesus that he recognizes that Jesus came from God and that God is definitely with Him. Jesus then replies, “no one can see the kingdom of God unless he is born again.” Then he says a second time, no one can enter the kingdom of God unless he is born of water and the Spirit. Jesus was not saying. Here’s how you get to heaven, he was saying, here’s how you get into the kingdom of God. From what we have previously written, the Kingdom of Heaven or Kingdom of God is right now, God’s rule and reign now, where people are calling Him Lord and His will is being done. His goal was not necessarily just to get a bunch of people to heaven, it’s his goal to get a community of people to be obedient, so that his kingdom is operating like it’s supposed to right now. We have used the term “being saved” or “born-again” to signify the end of the process. We got saved and so now it’s settled, we have our papers, were going to heaven when we die. It seems to me that being saved is just the doorway to the Kingdom of Heaven, it’s just the very beginning of the process. When you are saved, you realize for the first time that Jesus is who he said he was and you want to make Him your King by being obedient to Him for the rest of your days. You have seen his great acts of saving power, you call Him Lord and you obey – that is the Kingdom of Heaven. So being saved is just a starting place to begin that life of obedience. It’s not just did you get in the door, it’s a lifelong process. It’s like just getting married, that’s just the start of the process. If you’ve been married for 35 years and it’s been a lousy marriage, the whole time, does that make you married in God’s eyes? To be married for 35 years, and to have worked and gone through the hard times together and to learn to love and sacrifice for each other – that is a picture of the life of being saved. Obedience is what makes God happy, because you are revealing his nature to others. Obedience is not a burden, it is the answer to all the hurts and ills of Egypt. Being righteous really matters to God. This is a lifelong process and puts you in the kingdom of God. Then when you die, you will live with Him forever. Matthew 6:33: “But seek first his kingdom and his righteousness, and all these things will be given to you as well”. One other thing in this passage that I realized I had been teaching wrongly was Jesus’ statement “Unless you are born of the water and the Spirit”. I had always said you’re born of water the first time (natural birth), and then by the Spirit (spiritual birth). David Stern, in his Jewish New Testament commentary, says “Born of water” does not mean ordinary human birth, because if everyone was born of water ,in that sense, why would Jesus make a condition out of it and say “unless” you are born of water and the Spirit”. It now seems to me that “born of water” has to do with immersion, a ritual cleansing of the body for repentance, and “born of the Spirit” is referring to the Holy Spirit’s power to help you turn from sin and live a holy life. Both of these refer to aspects of purification. In summary, Matthew 22:29 says “You are in error because you do not know the Scriptures or the power of God.” This is just more evidence to me that I really do not know much about the word. I’m glad God is stretching me and having some of my old thoughts challenged. One thing I do know is that I am being challenged to be obedient. I know that it is not just a one step process. “I’m saved”, I got that taken care of. I’m on my way to heaven, and I’ll live life the best I can. We are supposed to be a kingdom of priests; priests dedicated their lives to serving. How could we do any less? Lord, please help me with obedience. I want to be like you in every way.